About once every two or three years, my wife and I hold a yard sale. It’s rather a sad thing that, like most people, we have such a propensity to collect ‘stuff’ that we need to have a sale to get rid of it periodically. Yet it happens to us all: at some point, we buy something that we think we’ll use now and forever; in reality, we use it once, maybe twice, or not at all – and it merely takes up space. Yard sales are sort of a form of entrepreneurial recycling. Other people are able to use stuff that we aren’t able to use. It saves the need to manufacture something new. We make a little money off of it. The (re-) cycle continues. Something old is made new again, in the hands of another. This got me thinking: God does this all the time! Every day, in places all over the world, God buys people. Or, maybe more correctly, God bought people. When Jesus came, he came to redeem the world – to buy it back. So every day, as more and more people place their faith and trust in Jesus as Lord and Saviour, God welcomes them into his family. They may be young and untried, old and tired, or somewhere in between. It doesn’t matter! God welcomes all who trust him and redeems them in Jesus. Those lives which were spent are now made new again in Jesus. God shows up at ‘human’ yard sales every day. He buys back those who will walk with him. Yet there are those who will not put themselves out there for God to redeem. They think they still can do it on their own. They want to try to keep going under their own power. These are the people we need to pray for. Pray that God will open their hearts to receive his redeeming love. If an old teddy bear that was missing half the stuffing could talk, it would probably have great memories, but not much self-worth. When the stuffing is half-knocked out of you, you don’t feel very good about yourself. But God would buy that teddy bear! No matter how we feel about ourselves, God will receive us. In fact, it is in God that we receive our self-worth! We can only love ourselves when we know that God first loved us. And God would go to yard sales far out of his way if he knew that one was ready to be redeemed by him. A far-fetched analogy? Maybe. But the truth remains the same: “For you know that God paid a ransom to save you from the empty life you inherited from your ancestors. And the ransom he paid was not mere gold or silver. It was the precious blood of Christ, the sinless, spotless Lamb of God” (1 Peter 1.18-19, NLT). As I get rid of stuff I no longer need or want at a yard sale, I’m giving thanks that God bought me with the precious blood of Jesus. How about you? While I was on vacation, I spent some time ‘digitizing’ some old memories. I have a number of VHS video tapes commemorating some special occasions. Knowing that such tape has a ‘shelf life’ of sorts, it seemed to me expedient to transfer them to DVD. So I bought the appropriate computer paraphernalia to do so, and went to town. Among the things I copied to DVD were some sermons I had preached for a class in seminary, and the service of worship for my ordination (we’re talking ancient history here!). Both recordings are worth keeping, and each is instructive to me in its own way. The tape of my old preaching class sermons reminds me of how far I’ve come. The tape of my ordination reminds me of where I come from, in a ‘church’ sense. Watching myself preach in my earliest days of preaching is not easy; it makes me feel sorry for congregations that had to listen to me! Watching my ordination service helps me recall that God set me aside for a special purpose. Seeing that particular tape was especially emotional, since there were many people at that service who hold a special place in my heart. Some are living, others have died, but each played a significant role in getting me to that stage of life and ministry. You can understand why I’d want to preserve the memory of my ordination service. You might wonder why I would want to keep the DVD of my old classroom sermons! Yet, good, bad, and ugly – each is a memory of my past. God knows where we’ve come from. He understands our joys and sorrows. He has walked alongside us when we’ve lived righteously, and when we’ve committed all our sins. That may make us shudder. But the good news in the midst of all that is that when we choose faith in Christ, God does not remember those times when he walked alongside us in our sin. People of old often lived in fear of God; many people today, even some who claim to be people of faith, live in fear of God. Yet it was centuries ago that God promised to his covenant people that they would not need to live in fear: “I will put my laws in their minds, and I will write them on their hearts…. And I will forgive their wickedness and will never again remember their sins” (Jeremiah 31.33b, 34c, NLT). Really, when God looks at a follower of Jesus, Jesus is who he sees! That’s amazing news. God’s tape of our sins has been erased, and will never be transferred to DVD. We are free to live to praise the Lord! When we think about the Great Commission, most of us think about two verbs: “go” and “make disciples”. And to be sure, these are extremely important verbs! Without them, the church could not prosper. There’s also “baptizing”, which we do in obedience to Christ. And there is still another verb in the Great Commission: “teaching”. Some think that this verb relates to Sunday School or children’s ministry, or maybe even adult Bible study, and it does – but it goes even further. Yesterday, I had the privilege to attend a seminar to equip teachers. It was hosted by SUBS – the School of Urban Biblical Studies (a division of SIM). You can learn more about it at www.urbanbiblicalstudies.org. SUBS is a ministry that is starting this fall, intended to provide low-cost, high-quality theological education, principally for immigrant church leaders who could never otherwise afford training. Particularly in the Greater Toronto Area – but elsewhere in Ontario, too – non-English speaking congregations are popping up, and are in acute need of leadership. Spiritually gifted leaders are rising to meet the need, but their circumstances neither allow them to give up their regular jobs, nor permit them to engage in the usual intramural study of ministry. SUBS is set up to allow these folk to take courses to equip them for ministry; what’s more, each class will be housed in a church that is within reasonable walking distance of a transit line, since most of these immigrant pastors do not have cars. “Cry out for insight and understanding. Search for them as you would for lost money or hidden treasure. Then you will understand what it means to fear the Lord, and you will gain the knowledge of God” (Proverbs 2.3-4, NLT). Teaching is an important part of the Great Commission; and if church leaders are not taught, then church members will not be able to be taught! If you are a church leader, do all you can to gain as much wisdom from the Lord as you can through solid teaching. If you are someone who sits under a church leader, encourage him or her to continue to be taught well, that you, too, may be taught well! For when we stop learning, we stop living. Many of us don’t take enough time to rest, and don’t take as much formal vacation time as we should. Many North Americans take less vacation time than they are allotted by their work each year. Where I work, they so discourage us from carrying over holiday time from year to year that it is required to get permission from one’s supervisor in order for it to happen. They want us to take all the vacation time we’ve got coming year by year. I think this is a good thing. R&R was God’s idea in the first place. The Bible tells us, in the Genesis 1 creation story, that after six days of busy creating, God took a day off. In fact, God instituted that the day be ‘sanctified’ – made holy – so that people would take seriously the need for a day of rest and worship. Lots of people neglect the worship; the church is working on that one! But sadly, many people also neglect the rest as well – and, perhaps ironically, one of the most guilty groups of people for neglecting God’s gift of rest is clergy. Yep, my kind. The ones who put in much of their time teaching the Bible neglect the gift of rest in which the Bible enjoins us to engage. Particularly in the church, we often equate ‘busy’ with ‘faithful’. This is especially true of pastors, who (depending on their polity) often have a congregation full of bosses measuring their productivity. It’s wise to look busy. Yet congregations sometimes have odd definitions of productivity. My father-in-law, when he was in full-time ministry, would receive phone calls from church members in his study at the manse. When my mother-in-law would answer the calls, saying that her husband was out in the garden and that she’d go and get him, the callers would insist that he be left alone; yet if she said that he was in the study, reading, the callers would ask to disturb him! I wouldn’t want to say that there isn’t spiritual value in gardening; many gardeners tell me there is. But it’s actually a major part of the ‘real work’ of the pastor to read and study! Rest and relaxation is a blessing from God, because it is what enables us to recharge for more of the work that God calls us to do. That takes many forms. For me, the highlight of my summer is a weekend at a cottage on an island in Georgian Bay. (The photo is the view from just below the deck of that cottage.) The three or four days we spend there, with good friends, recharge my physical batteries in amazing ways. This week, we went camping at a Bible conference camp. It was a bit more work to be ‘off’, because we were surrounded by that with which we always work. But we made out well. 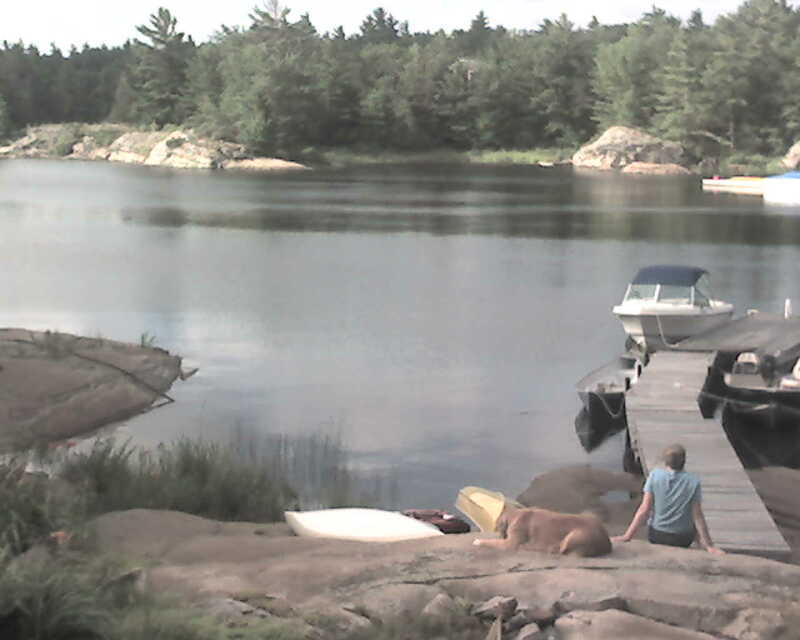 Next week, we’ll spend a couple of days at the cottage of other good friends before heading back to work – recharged. God, thank you for the gift of rest! I have several outstanding memories from my seminary days, most of which (perhaps surprisingly) are academic. One of the strongest memories is learning the “Ten Most Unwanted Public Prayer Habits” in a pastoral studies class. I won’t bother to number all ten of them for you, Dear Reader, since I’d rather not even get you thinking about them, lest you take them up in earnest. The commonest of them all, though, is called “the prayer of the just”. You know what I mean: “Lord, we just ask that you’ll just be present with us…”, etc., ad nauseam. I don’t think it’s an overstatement to say that this ugly habit has reached epidemic proportions in the church, crossing denominational and traditional boundaries (no, it’s not restricted to evangelicals: I’ve heard some pretty high church folks offer the prayer of the just). Some even say it in such a way as to suggest that God has a new name: Father Weejus, as in “Father, we just…”. I have heard something this week – consistently, at least twice a day, in the forum of public prayer – that has trumped Father Weejus, to the point that I would add it as the Eleventh Most Unwanted Public Prayer Habit. Are you ready for this? “Dear God and Heavenly Father, Lord…”. Sounds innocent enough, doesn’t it? Well, maybe once. But when every prayer offered by an individual begins with this, it gets more than a little annoying – to me, anyway. Maybe I’m the only one. But apart from its general annoyance, I have other issues with it. First, starting a prayer with “Dear” connotes, to me, either a diary entry or the salutation of a letter. (And countless children have been taught, by example, in church, for years to begin prayers with “Dear God…”! Aaagh!) Heaven knows that we can be more creative than that when talking to God with and for others. Second, starting every prayer with the same thing suggests to me either that the person is largely not thinking (when it comes to prayer, at least), or that the person has an unbalanced understanding of the immanence of God. That is, when we talk to God, are we approaching him as our Friend our our Drinking Buddy? There is a bit of a difference, I’d say: it’s important when we approach the Creator of the Universe in prayer – particularly when other people are listening, and expecting you to pray on their behalf, too – that we do so with due reverence before our Friend who is Totally Other. And, God does not expect us to check our brains at the door when we approach the Throne of Grace. The Bible is replete with names for God that can be used alongside “God”, “Heavenly Father”, and “Lord”. Many of those Old Testament stories that have been rehearsed in our minds for years contain names for God that we can use when we talk to him. How about “El Shaddai”? “Jehovah Jireh”? “Sovereign LORD”? Or, turning to the New Testament, how about “Comforter”? “Helper”? “Saviour”? “King of kings”? One could go on, but grab a Bible handbook (or just use a search engine) and get cracking. We can expand our love for God by expanding our vocabulary about him. Please understand that I am not trying to take away from the importance of a personal relationship with God, even expressed in our prayer language! I knew a person at one time whose only prayer language to talk about God was the vocative: “O God”. That’s all God was. To me, that was perhaps less irritating than “Dear God and Heavenly Father, Lord”, but at the same time, it was also less personal. It was as if “O God” lived somewhere up in the ceiling tile; in this case, there was too much emphasis on the transcendent at the expense of the immanent. One of the things I love about God is that he is both completely transcendent and completely immanent. God is high and exalted, the Creator of the Universe. And God is personal, here-and-now enough, to care about every thought of my heart (and yours). The miracle of who God is says to me that he deserves both our love and our thought, especially when we’re talking to him publicly.